JNU Entrance Exam Eligibility 2016 is for those candidates who are interested to take admission in Jawaharlal University through respective entrance exam. Candidate can check all the eligibility criteria clearly before applying to a respective field. The details of JNU Entrance Exam Eligibility 2016 is given below. For Centre for International Politics, Organization and Disarmament: Master’s degree in Political Science, History, Economics, Geography, Sociology, Defence/Strategic Studies, International Relations and Area Studies with at least 50% marks or Master’s degree in Humanities and other Social Sciences with at least 60% marks or Master’s degree in Natural Sciences with at least 65% marks. For Centre for International Legal Studies: LL.B. (Three Year) degree after Bachelor’s degree with at least 55% marks or an LL.B. (Five year) degree with at least 55% marks in the aggregate or an M.A. with International Law as one of the subjects with at least 55% marks in the aggregate or an LL.M. degree with at least 50% marks in the aggregate. For Centre for International Trade & Development: Master’s degree in Economics with at least 50% marks and familiarity with Mathematics and Statistics upto Bachelor’s level. For Centre for South Asian Studies, Centre for IndoPacific Studies and Centre for Inner Asian Studies: Master’s degree in Political Science, History, Economics, Geography, Sociology, Defence Studies, International Relations and Area Studies with at least 50% marks or Master’s degree in Humanities and other Social Sciences with at least 60% marks or Master’s degree in Natural Sciences with at least 65% marks. For Canadian and Latin American Studies: Master’s degree in Political Science, History, Economics,Sociology, Defence/Strategic Studies, International Relations and other allied subject in Social Sciences and Humanities with at least 50% marks or Master’s degree in Natural Sciences with at least 60% marks. For US Studies: Master’s degree in Political Science, History, Economics, Sociology, Defence/Strategic Studies, International Relations, Humanities with at least 50% marks. All other Centres Master’s degree in Political Science, History, Economics, International Relations and Area Studies with at least 50% marks or Master’s degree in Humanities and other Social Sciences with at least 60% marks or Master’s degree in Natural Sciences with at least 65% marks. M.A. in Politics (with specialization in International Studies) Bachelor’s degree in any discipline under 10+2+3 pattern of education with at least 50% marks. at least 2 years research experience in reputed institutions with research publication(s) comparable to M.Phil. standard. In addition, they should have obtained Master’s Degree with FGPA of 6.00 in the 10 point scale/ comparable standard or equivalent percentage. M.Phil./Ph.D. in Languages/Subjects other than English, Linguistics and Hindi Translation. Master’s degree in the concerned language/subject with at least 50% marks. M.Phil./Ph.D. in English Master’s Degree in English or Linguistics or Sociology or History or Political Science or Philosophy or Folklore or Film & Communication Studies or Culture Studies or Comparative Literature with at least 55% marks. M. Phil/Ph.D. in Linguistics Master’s Degree in Linguistics or any other discipline with at least 50% marks. M. Phil/Ph.D. in Hindi Translation Master’s degree in Hindi/Hindi Translation with 50% marks and English or any Indian language as one of the subject at B.A. level other than Hindi or Master’s degree in any Indian/ Foreign language with 50% marks and Hindi as one of the subject at B. A. level. M.Phil. in Portuguese Master’s degree in Portuguese with at least 50% marks or Master’s degree in any other Romance Language (Italian, Spanish, French, Romanian) or in English with atleast 50% marks and an Advanced Diploma in Portuguese with atleast 50% marks. M.A. in English and Linguistics Bachelor’s degree in any discipline under 10+2+3 pattern of education with at least 50% marks. M.A. in German Bachelor’s degree in any discipline under 10+2+3 pattern of education with at least 50% marks with adequate proficiency in German. M.A. other than English, Linguistics and German Bachelor’s degree in any discipline under 10+2+3 pattern of education with at least 45% marks with adequate proficiency in the concerned language. Candidates who have already pursued B.A.(Hons. )/ M.A. language programme in two or more Centres of study of the School of Language, Literature & Culture Studies are not eligible to join M.A. Language programme. Senior School Certificate (10+2) or equivalent examination with minimum of 45% marks.The candidates who are due to appear in Senior School Certificate (10+2) or equivalent examination are eligible to apply. 1. Darul Uloom Deoband, U.P. 2. Mazahirul Uloom Saharanpur, U.P. 3. Darul Uloom Mau, U.P. 4. Miftahul Uloom, Mau, U.P. 5. Jamia Athria Darul Hadith Mau, U.P. 6. Jamia Faize Am Mau, U.P. 7. Madrasa Alia Mau, U.P. 8. Madrasa Muhammadia, Mau, U.P. 9. Madrasa Faizanul Uloom Bahadurganj, Ghazipur, U.P. 10. Madrasa Ihyaul Uloom Mubarkpur, Azamgarh, U.P. Candidates who have already pursued B.A./ M.A.,Language programme in two or more Centres of the School during their entire academic career are not eligible for admission. Minimum Age : 17 years as on 1st October 2015. Eighty percent of the seats in the First Year of 3- year B.A.(Hons.) programme in the School are earmarked for those who have either passed the Senior School Certificate or equivalent examination in the year 2014 or are due to appear in 2015, and the remaining 20% are open to all other candidates. Candidates who have obtained their Higher Secondary Certificate under the 10+1 pattern of education will be eligible for admission to the First-Year of the three-year B.A.programme if they have successfully completed the First-Year of Bachelor’s degree examination of a University under 10+1+3 pattern of education with the prescribed percentage of marks. B.A.(Hons.) 2nd Year other than German: First year of Bachelor’s degree or an examination recognised as equivalent thereto with at least 45% marks under 10+2+3 pattern of education with adequate proficiency in the concerned language. Certificate of Proficiency : Atleast Senior School Certificate (10+2) or an examination recognised as equivalent thereto with a minimum of 45% marks in aggregate. Diploma of Proficiency : Atleast Senior School Certificate (10+2) or an examination recognised as equivalent thereto with a minimum of 45% marks in aggregate and Certificate of Proficiency in the language concerned or an examination recognised as equivalent thereto. Advanced Diploma in Mass Media in Urdu: A Bachelor’s Degree under 10 + 2 + 3 pattern of education with a minimum of 45% marks in aggregate with Urdu as one of the subjects at High School or Intermediate or B.A. Level. M.Phil/Ph. D.: M.Sc. or equivalent degree, with at least 55% marks or equivalent grades, in Biological Sciences, Bioinformatics or Physical Sciences, as well as to those with M.B.B.S or M. Tech. or M.Sc. (Agriculture) or M. Sc. (Veterinary Sciences) degree with 55% marks. M.Sc. : Bachelor’s (B. Sc. or B Tech or equivalent) in Biological, Physical or Agricultural Sciences or Biotechnology under the 10+2+3 pattern of education with at least 55% marks. Masters degree in the subject concerned with at least 50% marks; or Master’s degree in allied subjects or Humanities with at least 55% marks; or Masters degree in Natural Sciences with at least 60% marks. For Centre for Studies in Science Policy: Master’s degree in Social Science or Humanities or Law or Management with 55% marks or Master’s degree in Natural Sciences or Bachelor’s degree in Engineering or Technology or Medicine with 60% marks. For Centre of Social Medicine and Community Health (M.Phil./ Ph.D. in Social Science in Health): Masters degree in social sciences or other disciplines allied to public health (as given on page 34) with 55% marks. For Centre for Women Studies: Master’s degree in Social Science or Humanities or Law with at least 50% marks. For Centre for the Study of Discrimination and Exclusion: Masters degree in Social Sciences with at least 50% marks. For Centre for Media Studies: Masters degree in Social Sciences or Humanities or Law or Cultural Studies or Media Studies with at least 50% marks. M.A. in Geography and Sociology – Bachelor’s degree in any discipline under 10+2+3 pattern of education with at least 45% marks. M.A. in Economics – Bachelor’s degree in any discipline under 10+2+3 pattern of education with at least 50% marks. Knowledge of Mathematics at 10+2 level is expected and will be tested for in the Entrance Examination. M.A. in Political Sciences – Bachelor’s degree under 10+2+3 pattern of education with at least 50 % marks in Social sciences and 55 % marks for those who have Bachelor’s Degree in science and technology disciplines. M.A. in Philosophy – Bachelor’s degree under 10+2+3 pattern of education with at least 50% marks in Social Sciences and Humanities and 55% marks in Science & Technology disciplines. M.A. in History and Development & Labour Studies – Bachelor’s degree in any discipline under 10+2+3 pattern of education with at least 50% marks. M.Sc. degree or equivalent in any branch of basic or applied science or MBBS or B.Tech. /B.E. with minimum 55% marks. After selection on the basis of either through entrance examination (Category I) or as JRF-NET qualified candidates (Category II) they have to provide their preference for research specializationsrepresenting the faculties within the Areas applied for. Bachelor’s degree in any branch of basic or applied science under 10+2+3 pattern of education with at least 55% marks. 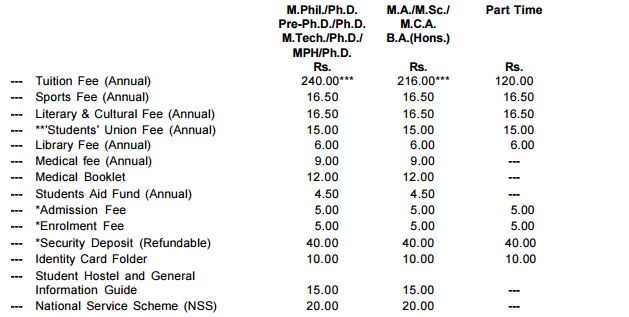 at least 2 years research experience in reputed institutions with research publication(s) comparable to M.Tech/M.Phil standard. In addition, they should have obtained Master’s Degree with FGPA of 6.00 in the 10 point scale/comparable standard or equivalent percentage. The applicant should have at least two research papers published in an international journal listed in Science Citation Index (SCI) or SCIE (Expanded) to be eligible to apply for the direct admission to Ph.D. programme. Master’s degree in Computer Science or Mathematics or Statistics or Operational Research or in any branch of Science or Bachelor’s degree in any branch of Engineering or Master of Computer Applications (MCA) with at least 55% marks. For Physical Sciences, M.Sc. degree in Physics, Chemistry or Mathematics, with at least 55% marks. Candidates having majored in Physics or Chemistry should have had Mathematics at least up to the B.Sc. level. Exceptions can be made in case of applicants with B.Tech. (Electronics/Electrical) degrees provided they successfully qualify the entrance examination. For Chemical Sciences, M.Sc. degree in Chemistry or Physics, with at least 55% marks. Candidates majoring in Chemistry should have specialization in Analytical/Organic/Inorganic/ Physical Chemistry/Chemical Physics/Polymer Chemistry at the Master’s level. For Mathematical Sciences, M.Sc. degree in Mathematics, with at least 55% marks. Candidates who satisfy the background criteria specified above for Category I candidates and have qualified for Junior Research Fellowship through CSIR/ UGC National Eligibility Test (NET) or NBHM Ph.D. scholarship test are eligible to apply separately in the prescribed form under this category for all the three programmes i.e. Physical, Chemical and Mathematical Sciences. Candidates shall have to appear for an interview and their selection will depend on their performance in the interview. Candidates who have appeared in the CSIR/UGC NET/NBHM examination but whose results are awaited may also apply under this category. However, such candidates will only be interviewed upon submission of a valid proof of having qualified for or awarded the JRF certificate at the time of interview. Moreover, only those candidates with valid proof of JRF qualification would be provided permissible travelling allowances for attending the interview. Please note that candidates who have been awarded “Lecturership” in the CSIR/UGC examination are not eligible and will not be interviewed. Direct admission to Ph.D. Programme Direct Admission to Ph.D. Program in Computational Biology and Bioinformatics, Complex Systems is available based on JNU Entrance Exam Eligibility. Candidates with Advanced Diploma (after M.Sc. degree) in Bioinformatics are also eligible if they secure minimum Final Grade Point Average (FGPA) of 6.00 in 10 point scale/comparable standard or equivalent percentage. Master’s Degree in any branch of Sciences such as Biology, Chemistry, Bioinformatics, Mathematics, Physics, Statistics, Computer Science/MCA. MBBS or BHMS or equivalent degree as recognized by Government Council such as MCI. B.Tech or B.E. or equivalent degree in any branch of Engineering, B.Pharma degree or equivalent. Minimum requirement is 55% marks in the above examinations, Further Mathematics as a subject till Class XII is compulsory. Candidates who have qualified the National level Junior Research Fellowship examination through CSIR/UGC National Eligibility Test(NET), “BINC”, “DBT”, “ICMR” are eligible to apply separately in the prescribed form under this category. Candidates shall have to appear for an interview and their selection will be based on their performance in the interview. Candidates who have appeared in the CSIR/UGC NET examinational but whose result are awaited may also apply under this category. However, such candidates will be interviewed upon submission of a valid proof of having qualified for or awarded the JRF certificate at the time of interview. Moreover, candidates with the valid period of JRF qualification only would be provided permissible traveling allowances for attending the interview. Please note that candidates who have been awarded only “Lectureship” in the CSIR/UGC examination are not eligible and will not be called for interview. A minimum of 55% marks in the qualifying degree and Mathematics as a subject till Class XII is compulsory. A minimum of 55% marks in Bachelor’s degree in any branch of Basic and Applied Science or Technology, including medicine and engineering disciplines. Candidates would be selected only through an entrance examination. Direct Admissions to the Ph.D Programmes Only those candidates shall be considered for Direct admission to the Ph. D. Programme who have based on JNU Entrance Exam Eligibility. at least 2 years research experience in reputed institutions with research publication(s) comparable to M.Phil. standard. In addition they should have obtained Master’s Degree with FGPA of 6.00 in the 10 point scale/ comparable standard or equivalent percentage. Master’s degree in Sanskrit or in an allied subject (with Sanskrit up to B.A. level) with at least 55% marks. Bachelor’s Degree in Sanskrit or in any other subject under 10+2+3 pattern of education with at least 45% marks. Atleast Senior School Certificate (10+2) or an examination recognised as equivalent thereto with a minimum of 45% marks in aggregate. Programme in “Molecular Medicine” (Through JNU Entrance Test) Master’s degrees or equivalent from recognized University /Institution in any branch of Biological Sciences / Chemical Sciences / MBBS/ BVSc/ B.Pharm with at least 55% marks. Bachelor’s degree in any branch of basic or applied sciences (including MBBS and BVSc.) from recognized Universities and Institutes with at least 55% marks. at least 2 years research/administrative/legal experience in reputed institutions with research publication(s) comparable to M.Phil. standard.In addition, they should have obtained Master’s Degree with FGPA of 6.00 in the 10 point scale/comparable standard or equivalent percentage. Master’s degree in Law, Political Science, Public Administration, Economics, Sociology, History, Philosophy, Social Work, Development Studies and cognate areas/disciplines in the social sciences or humanities with 55% marks. Candidates must have M.Sc. / M.Tech./ M.E. / B.Tech./ B.E. degree with at least 55% marks or equivalent grade point. Candidates must have had mathematics at least upto 12th standard or equivalent. 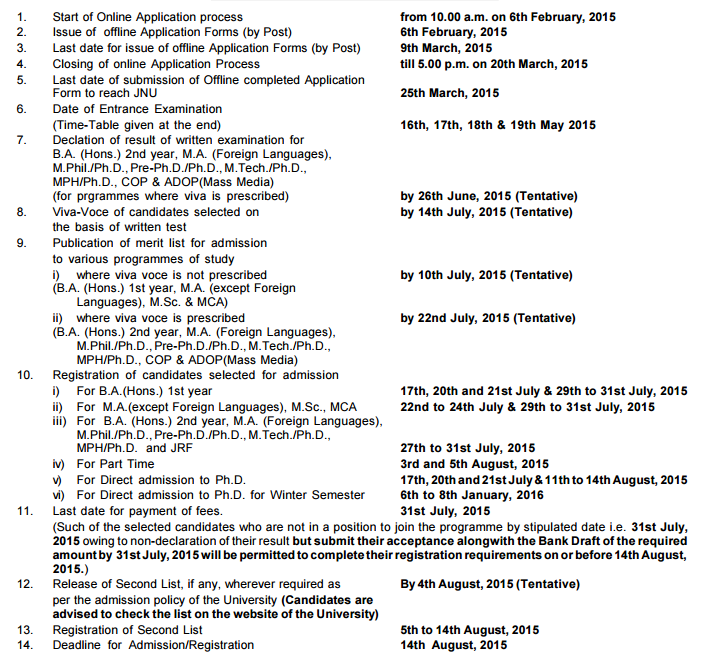 Jawaharlal Nehru University Entrance Exam 2015 invites application for various programmes such as M.Phil./Ph.D., Pre-Ph.D./Ph.D., M.Tech./Ph.D., MPH/Ph.D., M.A., M.Sc., MCA, B.A.(Hons.) and Part-Time courses. Candidates whose who are interested to apply can check all the details from the details given below. The Jawaharlal Nehru University constituted under the Jawaharlal Nehru University Act 1966, (53 of 1966) came into existence in 1969. JNU Entrance Exam 2015 is available in Online and Offline both mode. Candidate can apply in both mode from 6 February to 9 March. Candidates can apply online through the websites and offline by downloading the form from the website and send it through post. JNU Entrance Exam 2015 Result is declared as per the scheduled date mentioned in table. The various updates related to JNU Entrance Exam 2015 is given below. Candidate can check according to that. Medical Certificate prescribed, if any, by the Government of India. Insurance for Rs.1.00 lakh (minimum) Candidates already in India during entrance examination will not be considered for admission in absentia and they will have to go through the process of entrance examination for admission to various programmes of study. Certificates and documents required to be submitted by candidates for admission to M.Phil./Ph.D., PrePh.D./Ph.D., MPH/Ph.D and M.Tech/Ph.D., at the time of viva-voce examination. Two attested copies of the statement of marks obtained by the candidate in Senior School, Bachelor’s Degree/ Master’s Degree examination etc; or their equivalent examination. For SC/ST Candidates: Two attested copies of SC/ ST Certificate in the prescribed format (page 91) issued only by an officer not below the rank of Magistrate/ Tehsildar in support of their claim for admission against the reserved quota. For PH Candidates: A Medical Certificate issued by a Competent Medical Authority indicating the nature and extent (including percentage) of Physical Disability in support of their claim for admission against reserved quota.